The 2016 Nissan Altima is an amazing car that will have other drivers jealous of you when you're on the road. If you want to own a car that has flash and style, then you'll love everything about the 2016 Nissan Altima. The Nissan Altima has been revamped to be a thrilling ride that all drivers will enjoy! Premier Nissan of Metairie is located at 6636 Veterans Memorial Blvd. in Metairie, LA and serves the following cities: New Orleans, Gretna, Laplace, Mandeville, and Harvey, LA. 2016 Nissan Altima has a starting MSRP of $22,500. The MPG rating on the Altima is 27 city / 39 hwy. 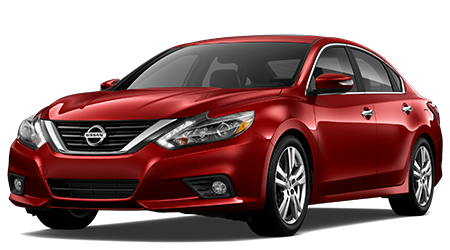 The 2016 Nissan Altima is a fantastic small sedan that is loaded with a plethora of features and amenities you'll love. There are seven models to select from2.5, 2.5 S, 2.5 SR, 2.5 SV, 2.5 SL, 3.5 SR, and 3.5 SL. Exterior colors include Brilliant Silver, cayenne red, glacier white, gun metallic, java metallic, pearl white, storm blue, and super black. The interior color has a choice between charcoal or beige cloth. The 2016 Nissan Altima comes equipped with an 182HP 2.5L 4-cylinder engine. Features include 16" wheels, projector-type halogen headlights, dual chrome exhaust finishers, dual body-color power outside mirrors, active grill shutters, and UV-reducing solar glass. Interior features on the 2016 Nissan Altima include advanced drive-assist display, Bluetooth, air conditioning, power windows with one-touch driver-side auto up/down with auto-reverse power door locks with auto-locking feature, remote keyless entry, push-button ignition, remote trunk release, Fine Vision electroluminescent gauges, tilt and telescoping steering column,, Variable intermittent speed-sensitive flat-blade windshield wipers, sun visors with vanity mirrors, digital clock, map lights, overhead sunglasses holder, lockable glove box, dual-level center console, four cup holders, front//rear door map pockets with bottle holders, and retained accessory power and battery saver. Talk about the amazing features loaded with the 2016 Nissan Altima!. The trim on the 2016 Nissan Altima include 6-way manually adjustable driver's seat, cloth seat trim, black trim, and 60/40-split fold-down rear seatback. When you purchase a premium 2016 Nissan Altima, you're getting more power, luxury, and efficiency. The premium model of the Altima such as the 3.5 SL offers a 270HP 3.5L V6 engine. Standard features include 18" wheels, smart auto headlights, projector-type halogen headlights, LED headlights with signature LED daytime running lights, fog lights, dual chrome exhaust finishers, manual folding outside mirrors with LED turn signal indicators, heated outside mirrors with time, power sliding glass moonroof with one-touch open/close and tilt feature, front and rear sonar system, and UV-reducing solar glass. Interior features of the premium models include advanced drive-assist display NissasnConnect with navigation and 7" color touch-screen monitor, XM radio, voice command, rear view monitor, hands-free text messaging assistant, Bluetooth, HomeLink universal transceiver, dual zone automatic temperature control / air conditioning, in-cabin micro filter, rear passenger air conditioning console vents, power windows / door locks, Nissan intelligent key, push-button ignition, remote trunk release, remote engine start and stop system with intelligent climate control, cruise control with steering wheel-mounted controls, Fine Vision electroluminescent gauges, variable intermittent speed-sensitive flat-blade windshield wipers, sun visors with illuminated vanity mirrors and extensions, digital clock, Auto-dimming inside rearview mirror with digital compass, map lights and rear reading lights, mood lighting,overhead sunglasses holder, lockable glove box, dual-level center console, four cup holders, driver seatback pocket, slide cargo net, and two 12-volt DC power outlets. When you purchase the premium models, you'll see that your money was invested wisely in the extra amenities and features offered! . Standard safety features in the 2016 Nissan Altima include Nissan advanced air bag system with dual-stage supplemental airbags, driver and front passenger front/side airbags, roof-mounted curtain side-impact supplemental airbags, vehicle dynamic control with traction control system, blind spot warning, rear cross traffic alert, optional predictive forward collision warning, optional forward emergency braking, 3-point ALR/ELR seat belt system, front seat belts with pretensions and load limiters, lower anchors and tethers for children, zone body construction with front/rear crumple zones, hood buckling creases and safety stops, pipe-style steel side-door guard beams energy-absorbing steering column, and a tire pressure monitoring system with easy-fill tire alert. You can count on Nissan for having amazing safety measures on their cars! If you're looking for a stylish sports car in the form of a sedan with precision control and power you'll want to check out the 2016 Nissan Altima. Come to Premier Nissan of Metairie for an amazing selection of cars and an enjoyable experience! Premier Nissan of Metairie is located at 6636 Veterans Memorial Blvd. in Metairie, LA and serves the following cities: New Orleans, Gretna, Laplace, Mandeville, and Harvey, LA.